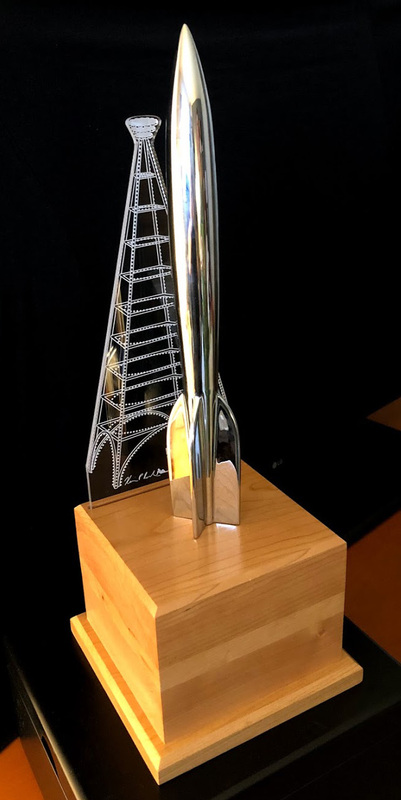 The 1943 Retrospective Hugo Award winners were announced during the First Night events on the evening of Thursday, August 16, 2018 at Worldcon 76 in San Jose, California. The Retro-Hugo Awards ceremony was not live-streamed, nor was it recorded. The World Science Fiction Society Constitution allows, but does not require, a Worldcon held an even multiple of 25 years after a year after 1939 at which no Hugo Awards were presented to present Retrospective Hugo Awards for works that would have been eligible for that year’s Hugo Awards if they had been held. (Once Retro-Hugos have been presented for a given year, no future Worldcon may present Retro-Hugos for that year.) Due to World War II, there was no Worldcon in 1943, and no Worldcon has previously presented Retro-Hugo Awards for that year. Worldcon 76 elected to present Retro-Hugo Awards for works generally first published in 1942 that would have been eligible for the 1943 Hugo Awards had there been Awards presented in 1943. Finalists for the 1943 Retrospective Hugo Awards were announced at multiple events on Saturday, March 31, 2018 at Noon Pacific Daylight Time and via a video announcement posted to YouTube that same day. Voting for the Hugo Awards is open to any supporting or attending member of Worldcon 76. Voting will open in April 2018 and will continue through the end of July 2018. There is no Hugo Award voting at the Worldcon itself. Voting ends before the convention to allow sufficient time to count votes and prepare trophies. Anyone who joins by the end of voting is eligible to vote. The 1943 Retrospective Hugo Awards were administered by Worldcon 76. See the Worldcon 76 Hugo Awards web page for details, and direct questions about the administration of the 2018 Hugo Awards to the 2018 Hugo Awards Administrators, not the Hugo Awards web site. The John W. Campbell Award for Best New Writer and the Award for Best Young Adult Book are not Hugo Awards and therefore there are no Retrospective versions of these awards. See Hugo Award Categories for a more detailed discussion of the categories. The technical definitions of the categories are in the version of the WSFS Constitution in effect for the 2018 Worldcon, and those technical definitions take priority in case of any ambiguity. Decisions regarding eligibility are made by the current year’s Hugo Administration Subcommittee, whose decisions are final in all cases.